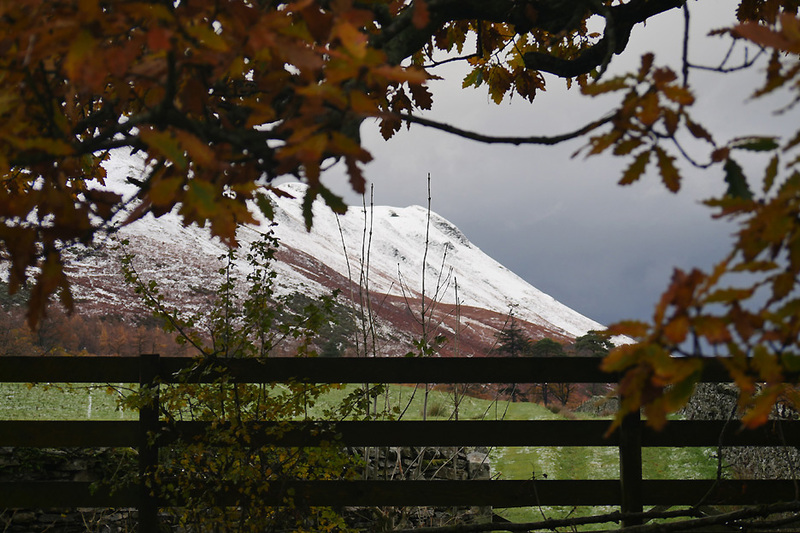 " Autumn Colours and First Snow "
Date & start time: November 2016, a selection of the last few local walks. 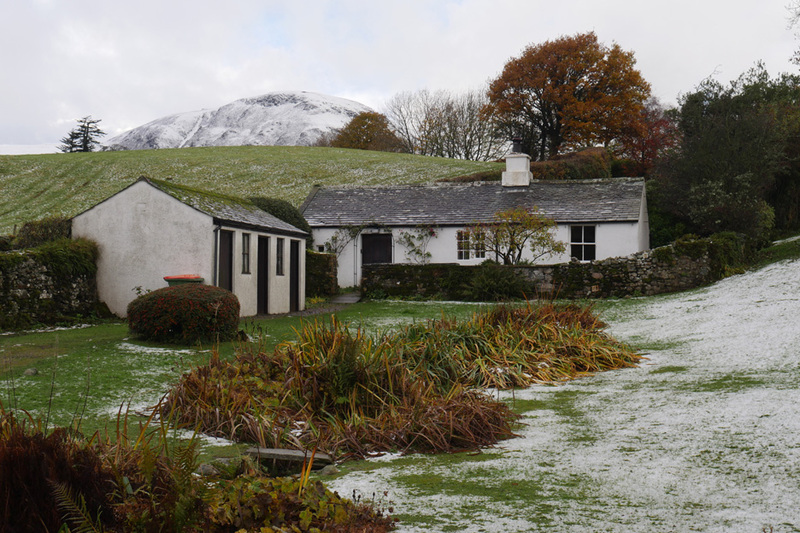 Places visited : The garden, Whinney Ridding, Lanthwaite and Gasgale Gill. Walk details : Local dog walks with the camera (and the dogs). 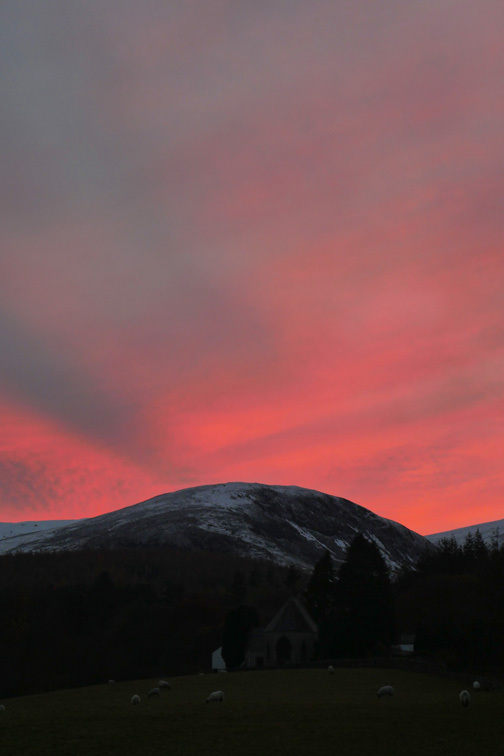 Highest point : The colours . . . 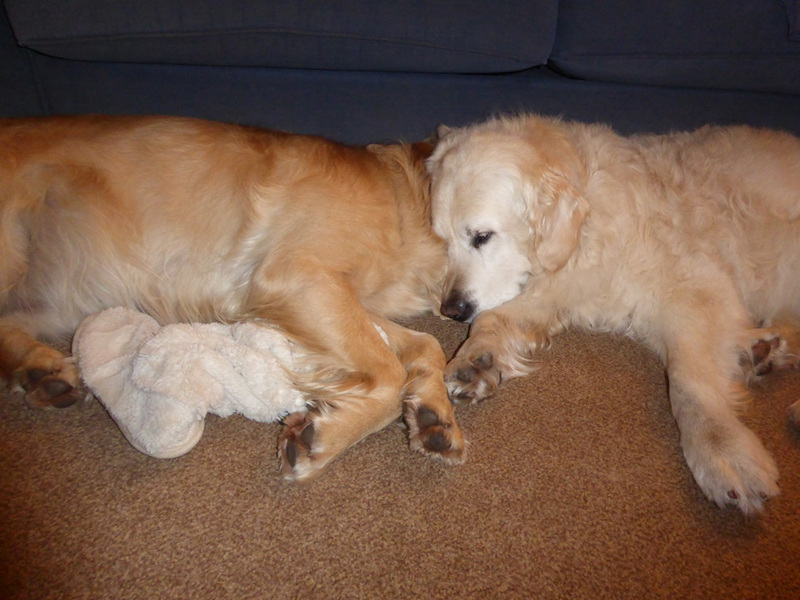 Walked with : Our dogs, Harry and Dylan. 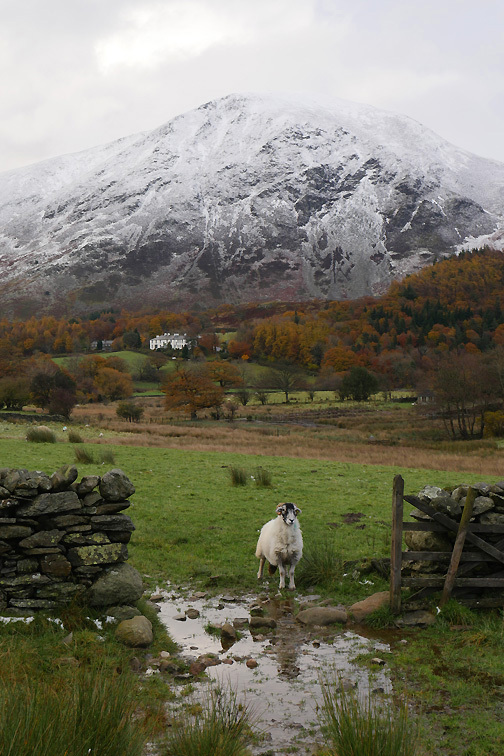 Weather : Autumnal and wintery. Sun through to snow. 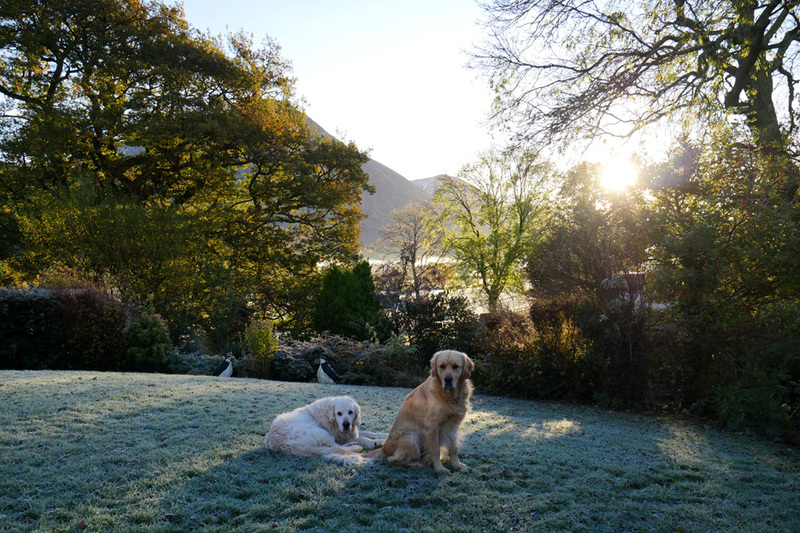 A compilation of local photos of the last few weeks taking the camera out on dog walks or frosty mornings. 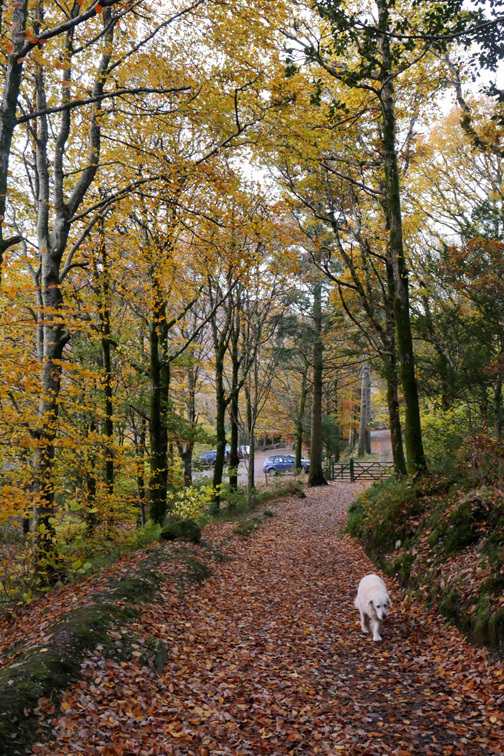 and thankfully the autumnal storms have stayed away. 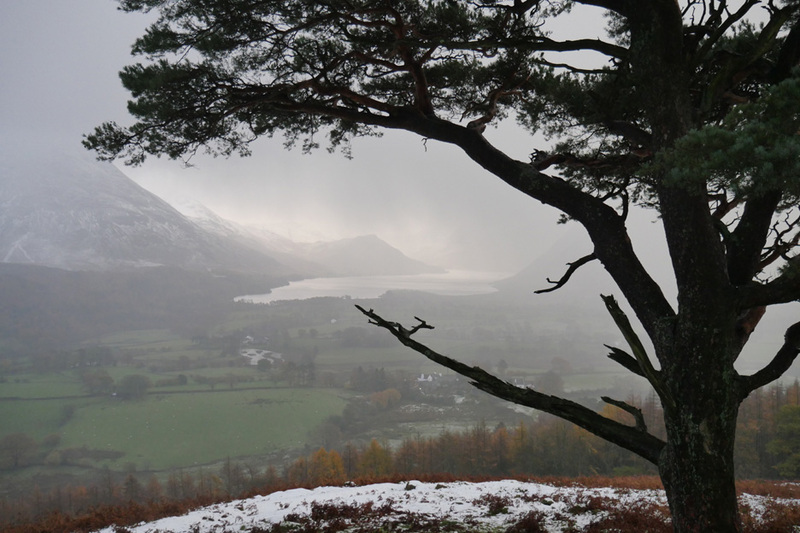 For a change I'll start with a photo that a Loweswatercam viewer sent in . 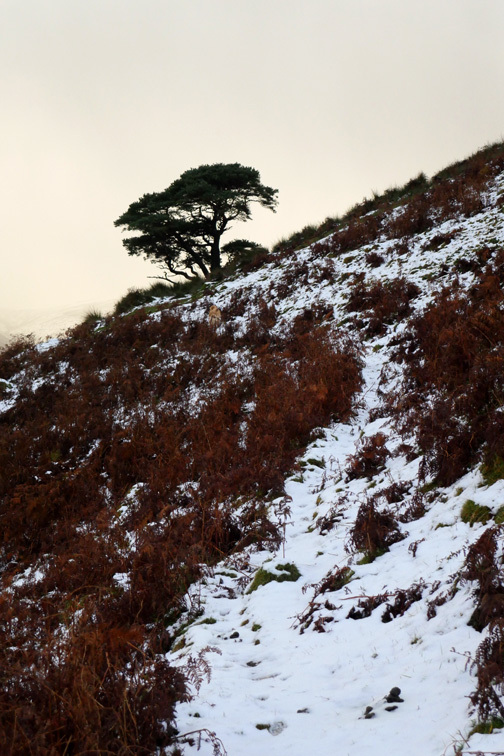 . . of the first snow in Yorkshire. 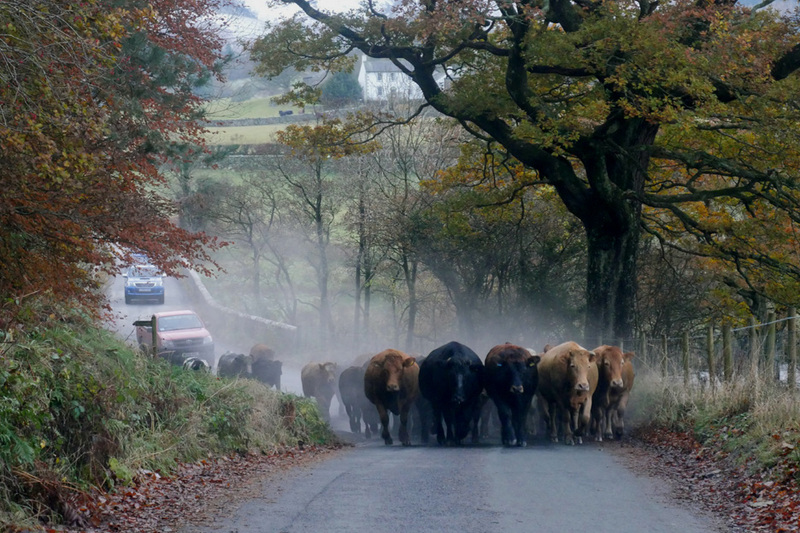 A big thanks to Colin (Farndale) for the view out of his house window on an early November morning. 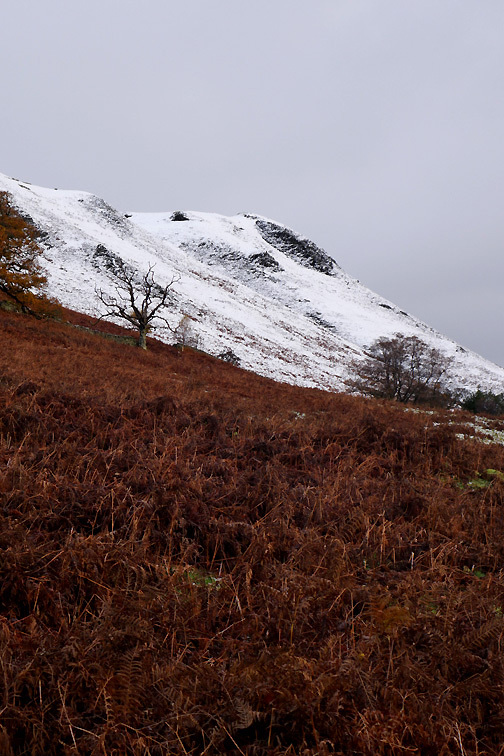 the snow beat me by 5 days this year and so the competition was over by Bonfire Night, Nov 5th. I couldn't enter the staff competition this year so Facebook is now the available public option . . . you can enter too . . . check out next October ! 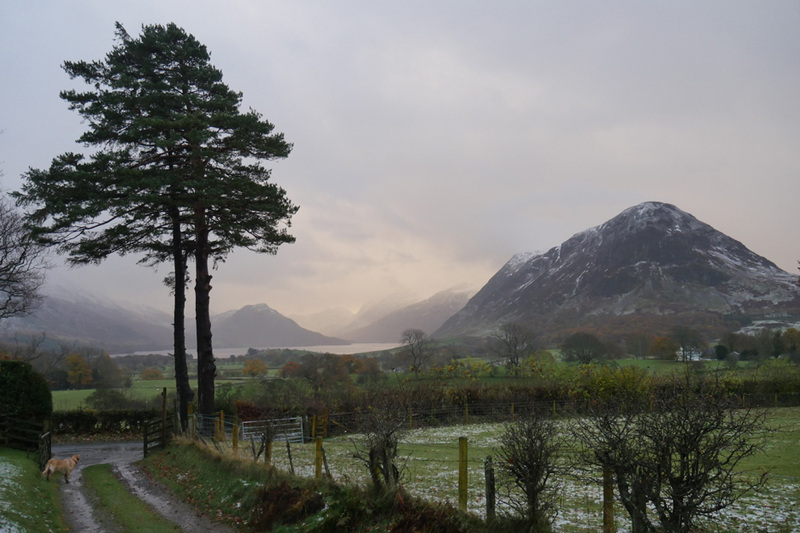 For us in the Loweswater / Buttermere area the snowfall was light. 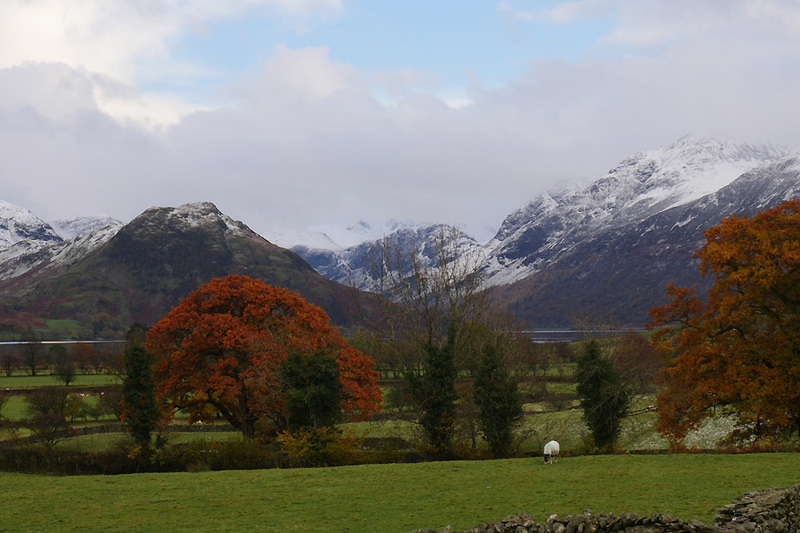 This was the view down Crummock Water to Great Gable on November 6th afternoon. 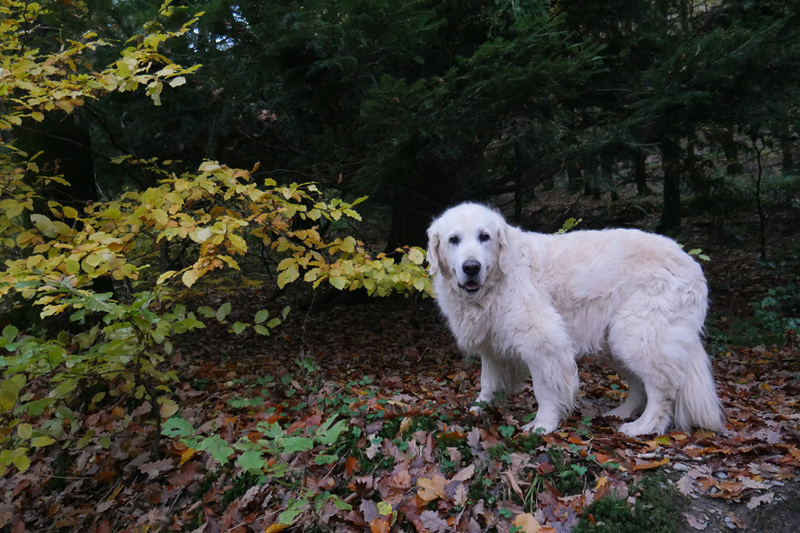 As usual our local walks are done after all the other day-to-day requirements are met. 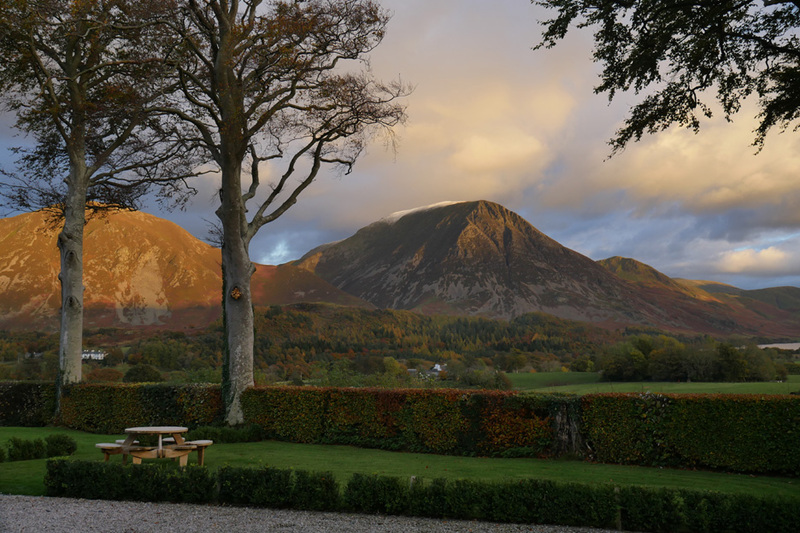 This was the view from Foulsyke's garden over to Grasmoor. 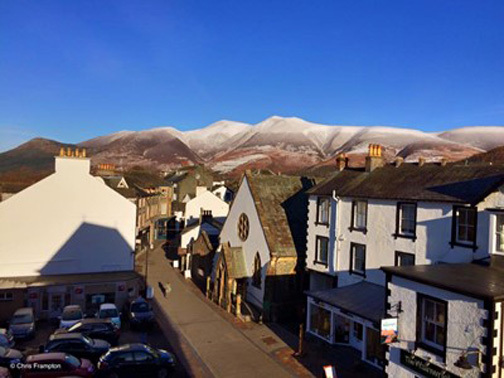 The old Scale Hill Hotel, now self catering apartments and cottages, nestle under Whiteside. 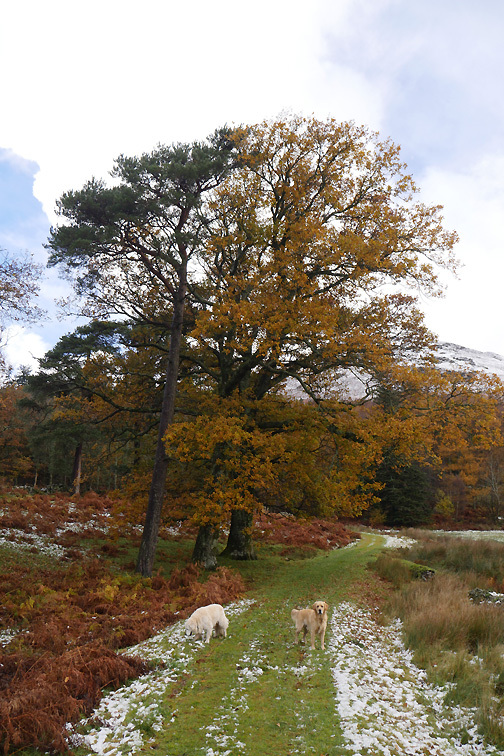 That's Swinside Fell behind the oak, with Broom Fell in Whinlatter to the left. As the walk progressed the sun sank lower into the scattered western clouds . 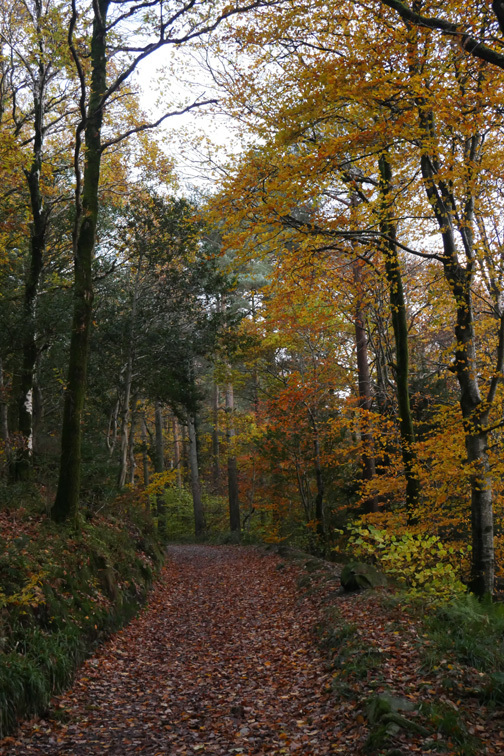 . . and the colour deepened. The final picture of that day . 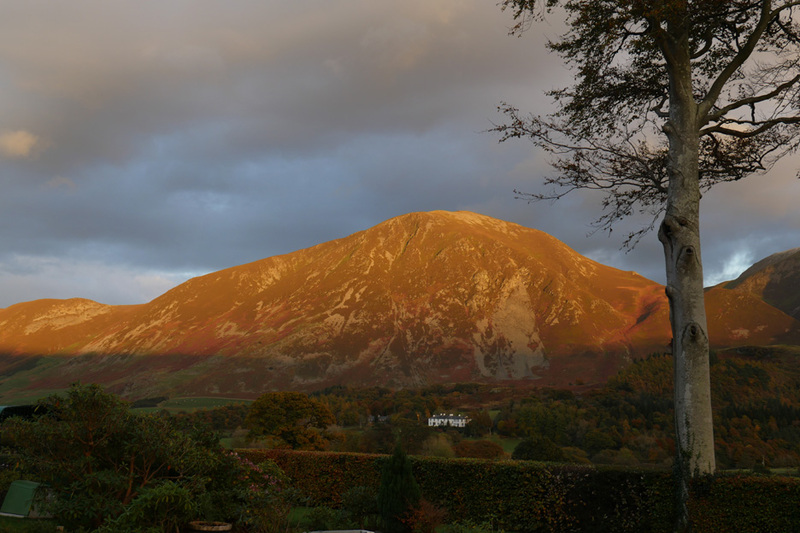 . . and the reason for the golden hue on Gable . 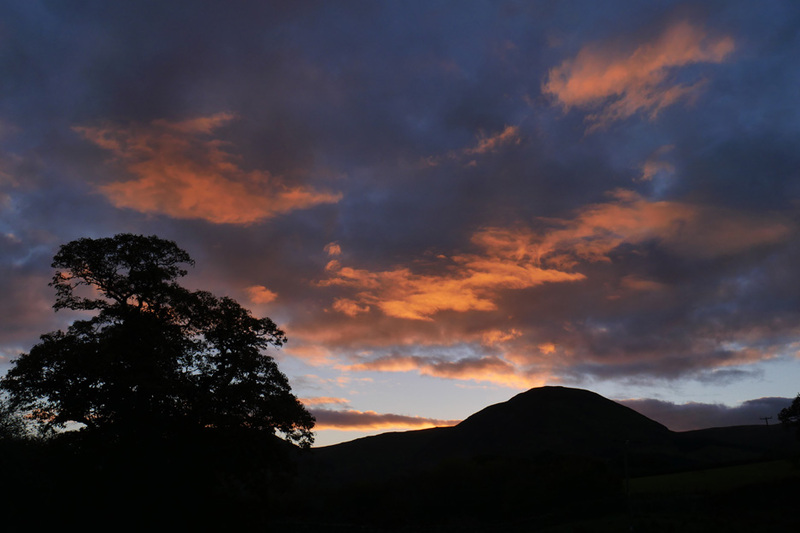 . . Sunset over Carling Knott. 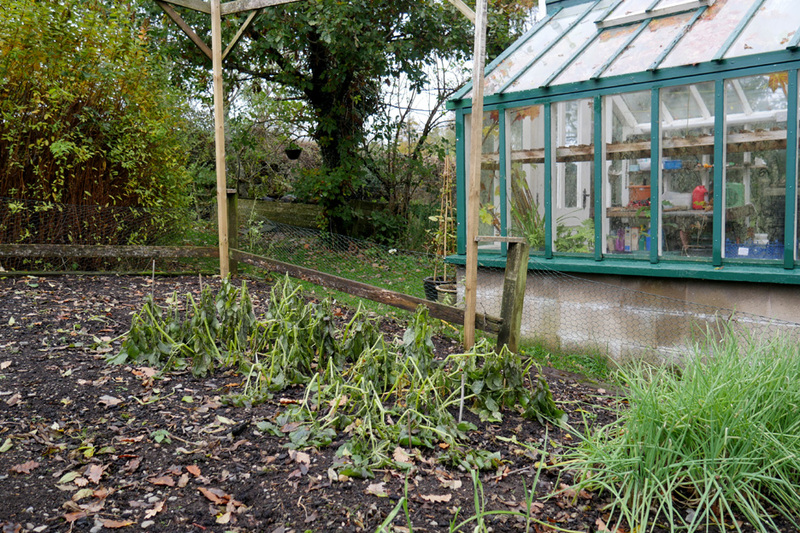 The overnight frost has not done our late potatoes any favours. The packet advertised "plant in September . . . potatoes for Christmas". The crop may not be as big as hoped ! 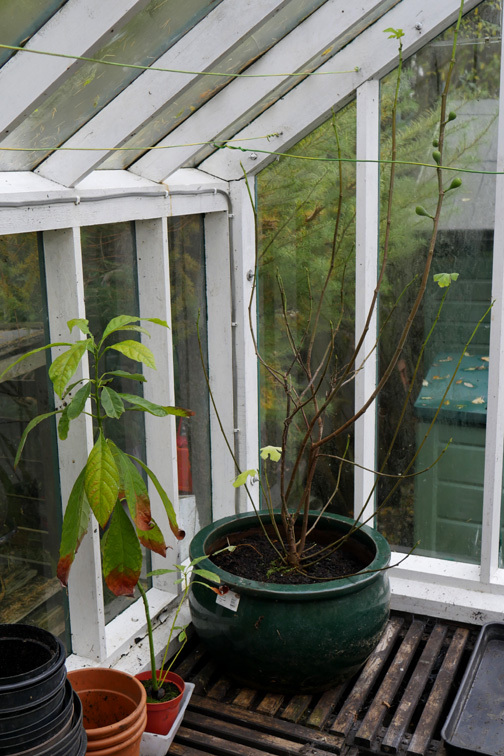 Autumn inside the greenhouse . 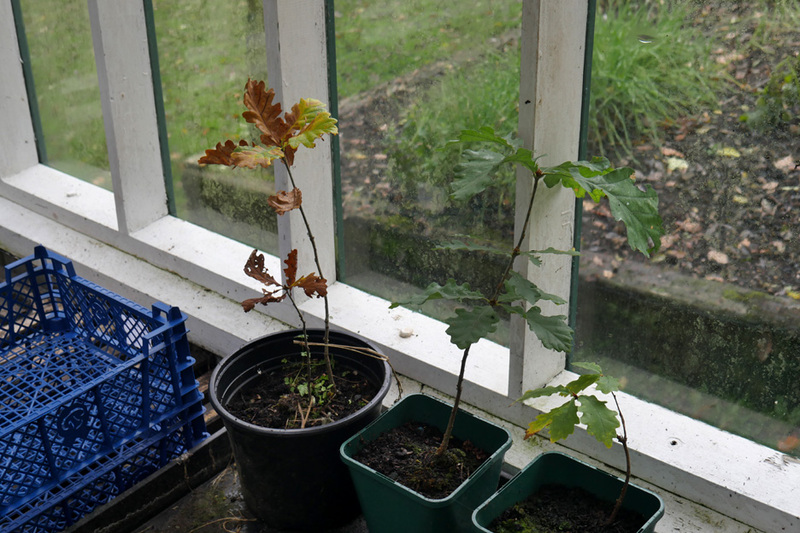 . . four oak seedlings found growing in awkward places in the garden during the year. 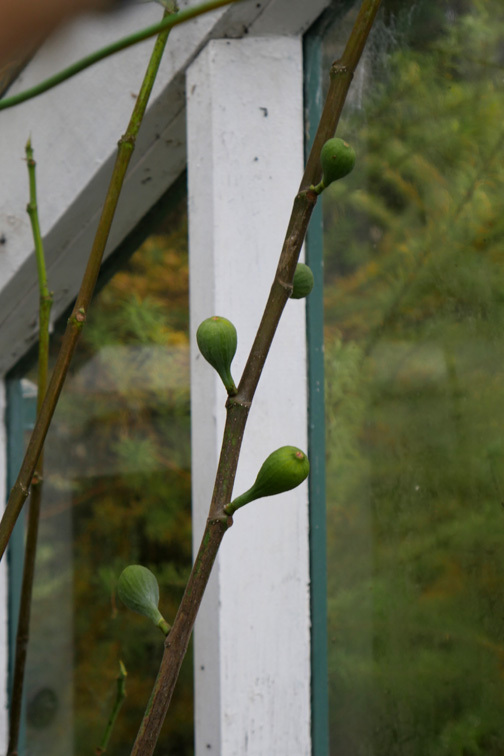 The fig plant has lost all its leaves . . .
. . . but the first year of figs are rather small. The final bunch of grapes . 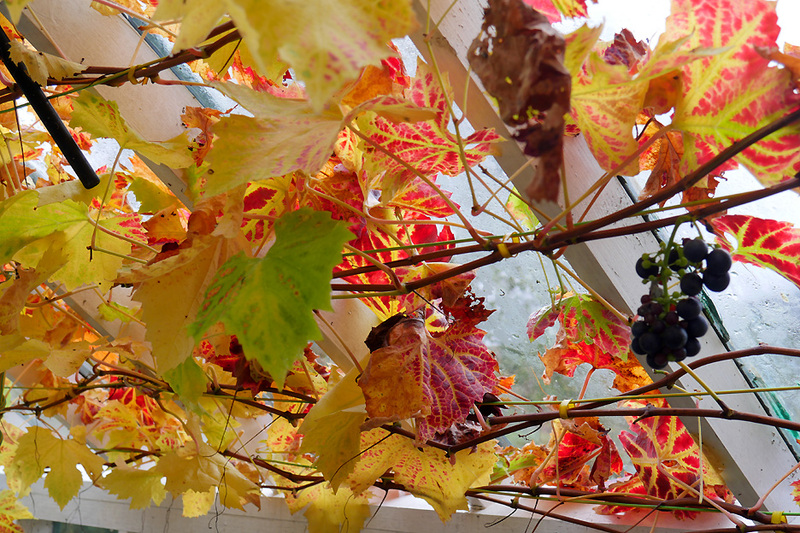 . . flanked by the most colourful end-of-season vine leaves. A deep overnight frost taken on this morning has left a white sheen on the field. 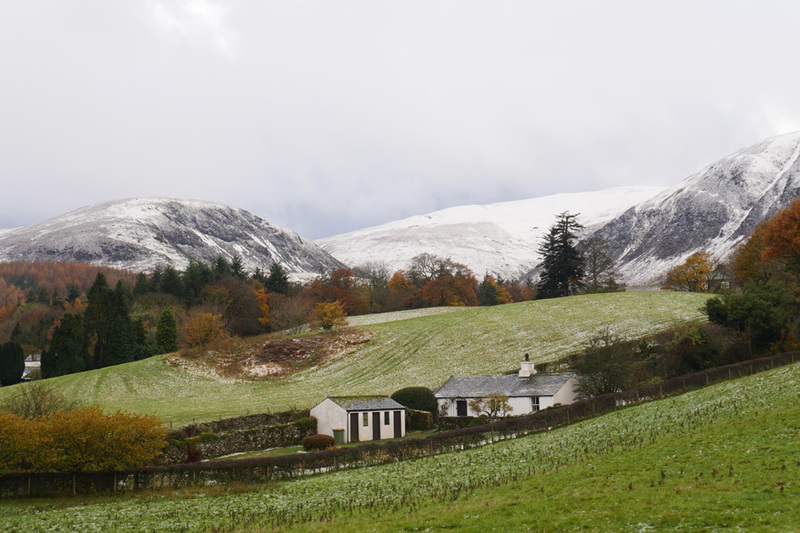 This is the view to Mellbreak, Hen Comb and Loweswater Church. Harry and Dylan in the garden after breakfast. 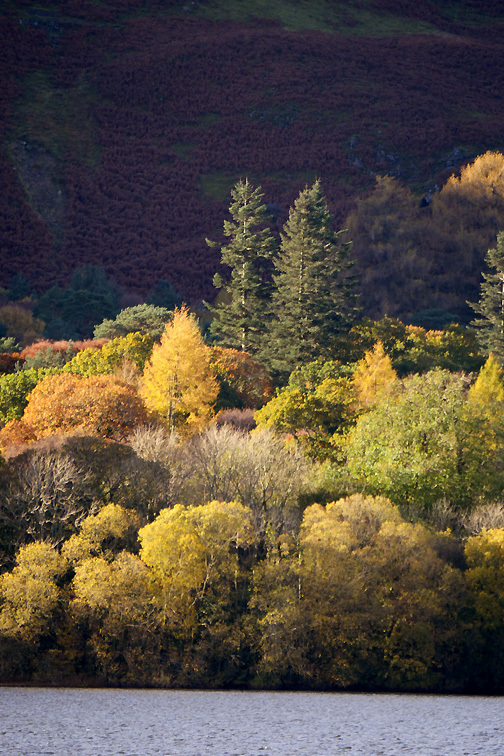 Early morning sunshine down the length of Loweswater is the best for autumn colours. We've only had one such classic morning so far this year that I've noticed . . . I'm a little late today and the fellside is in shade. Still . 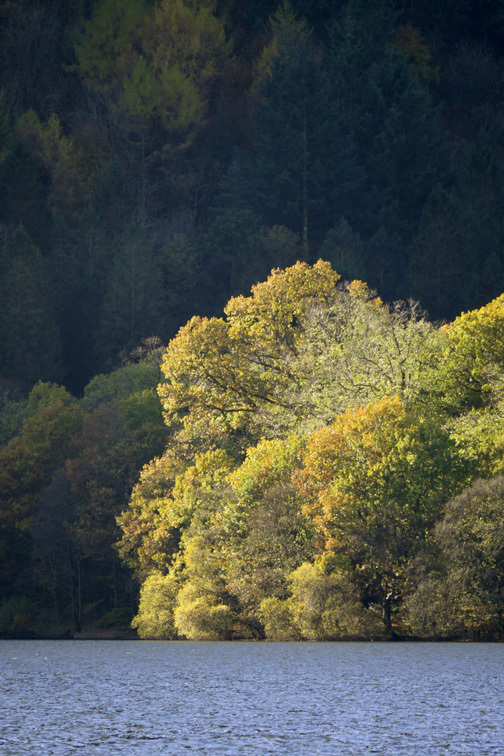 . . the sunshine is still catching the lower trees in Holme Wood. My pictures from 2012 are linked at the base of this page. Another day . 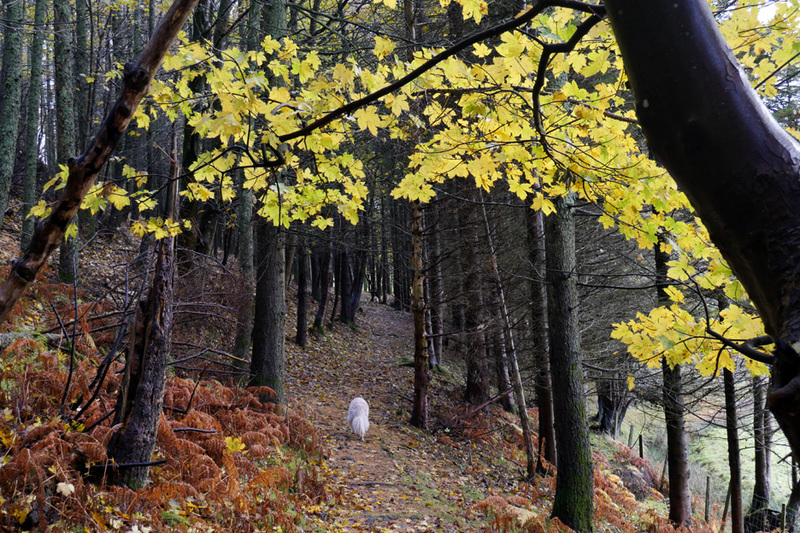 . . a local walk through Lanthwaite Wood . . .
. . . walking the beech covered tracks through the trees. Mid-walk . . . just a little more sunshine would be nice. 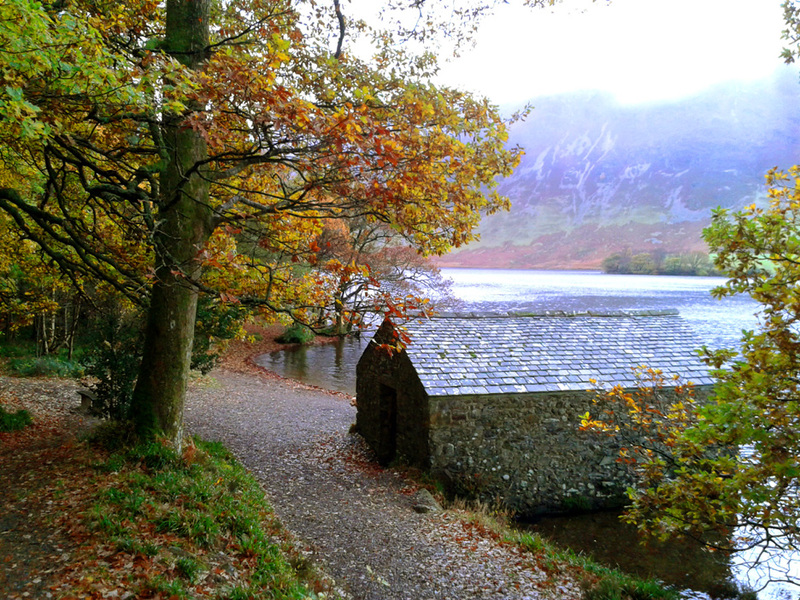 The boathouse on Crummock water. 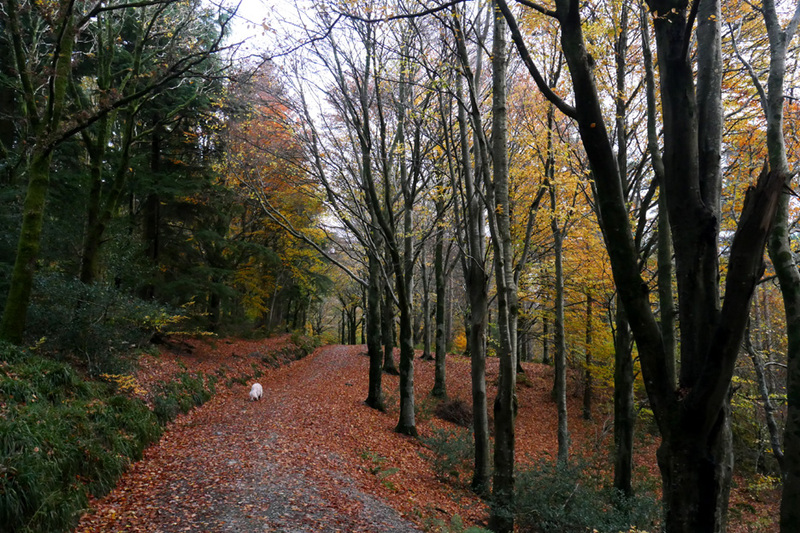 There are more leaves and colour on the oaks here than the beech trees further back. Harry up on the bank. With the flash of the mobile . 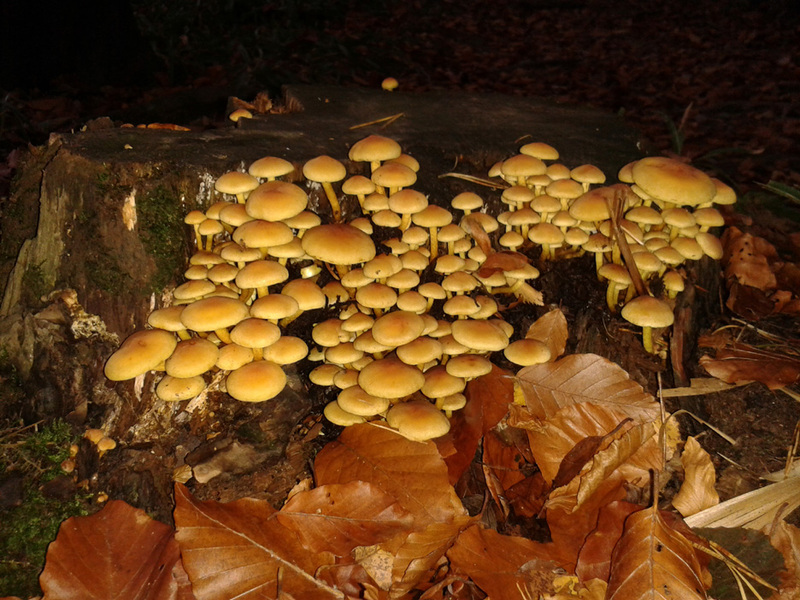 . . an old tree stump is the foundation of this colony of toadstools. 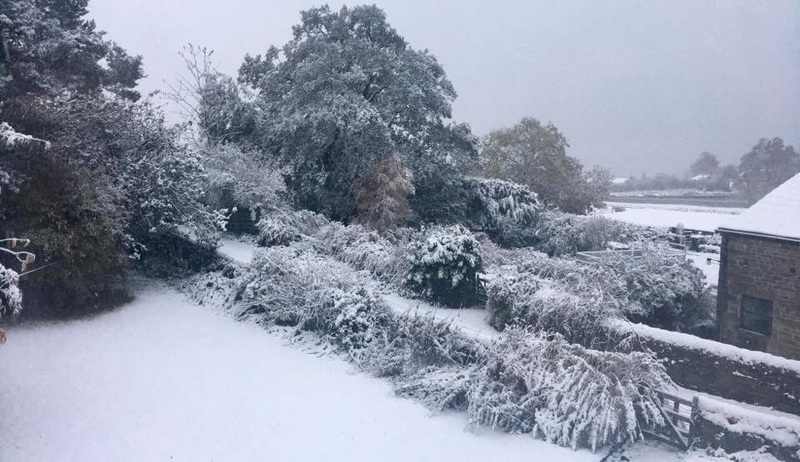 Our first snowfall at ground level came on the 18th . 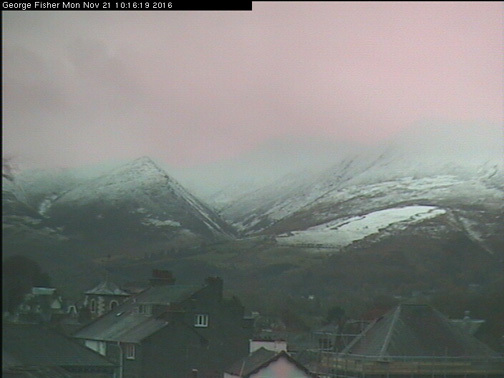 . . more as a result of heavy overnight hail and sleet rather than snow. The variety of colour this year is superb. Rose Cottage needs a clean and change-over prior to our daughter and friends arriving tomorrow. Not before we've fed the birds and the squirrel. 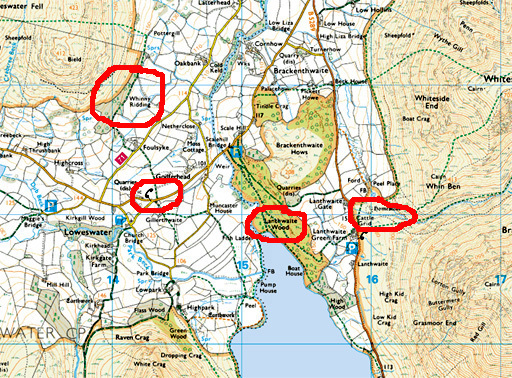 Watching Crag on Low Fell was the inspiration for my local walk later. 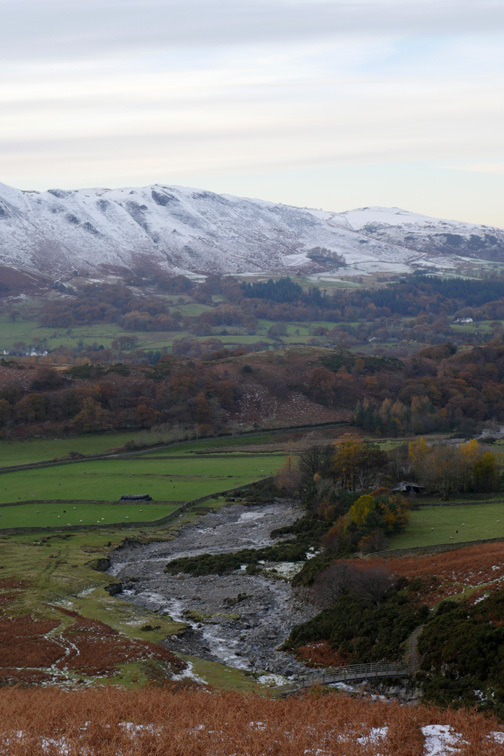 A patch of blue sky at the head of the valley . 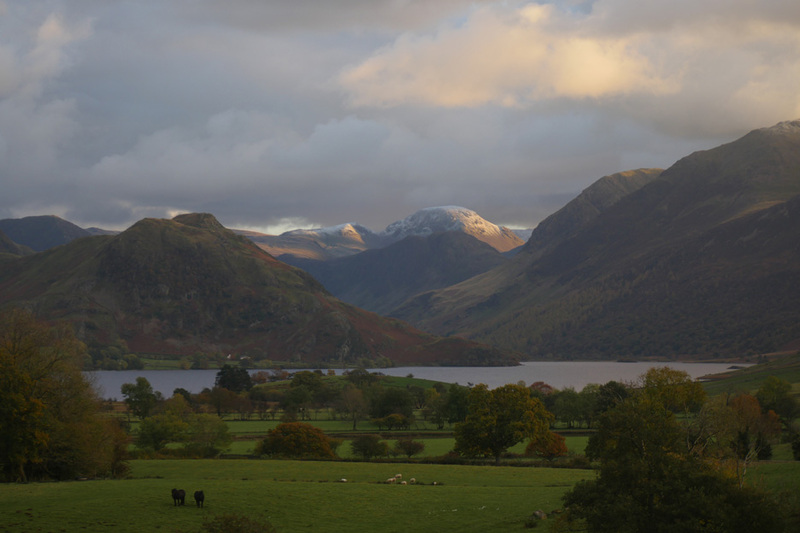 . . but the cloud is down on Haystacks and Gable is completely hidden. Another colour . 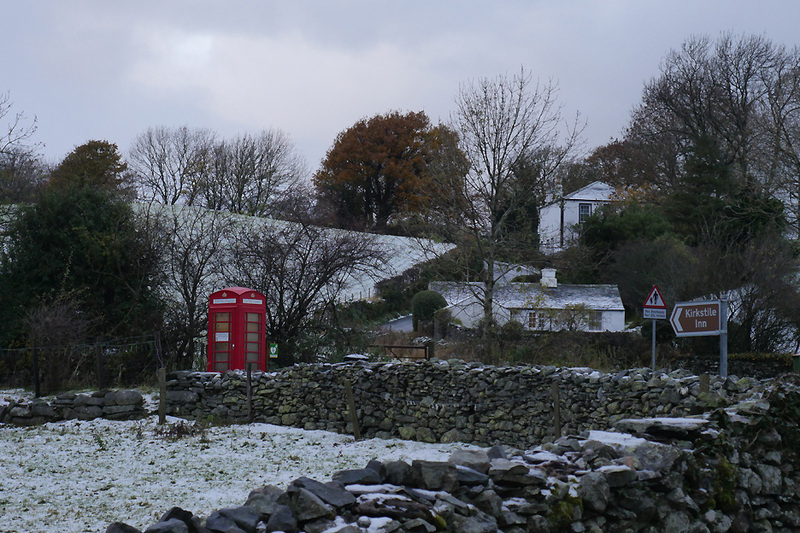 . . the bright red of our defibrillator phone box. Since its conversion in May this year it has attracted quite a lot of attention from folk parking on the gravel. 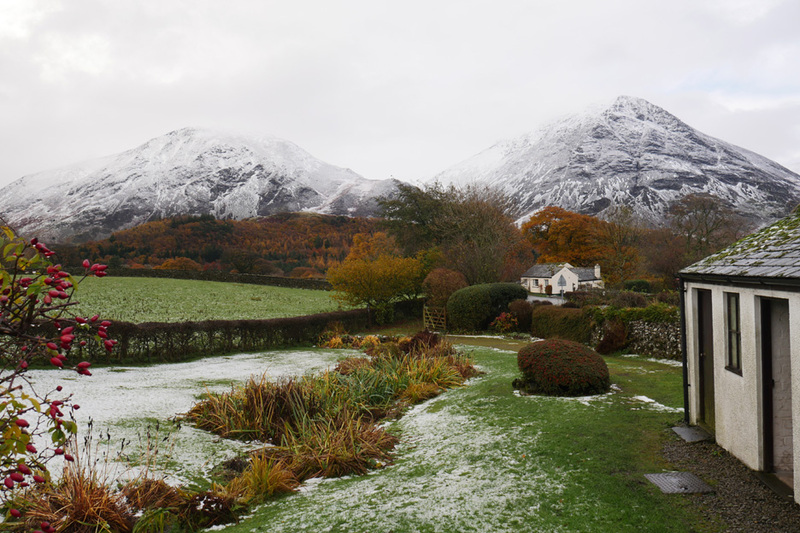 The view back from the front door including a cloudy Whiteside and Grasmoor. 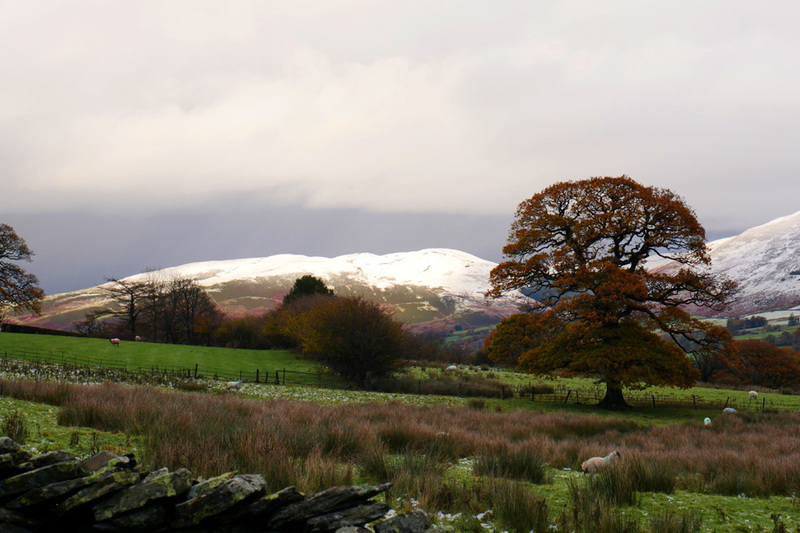 as I look across the fields at Black Crag and the snow covered slopes leading to Blake Fell. 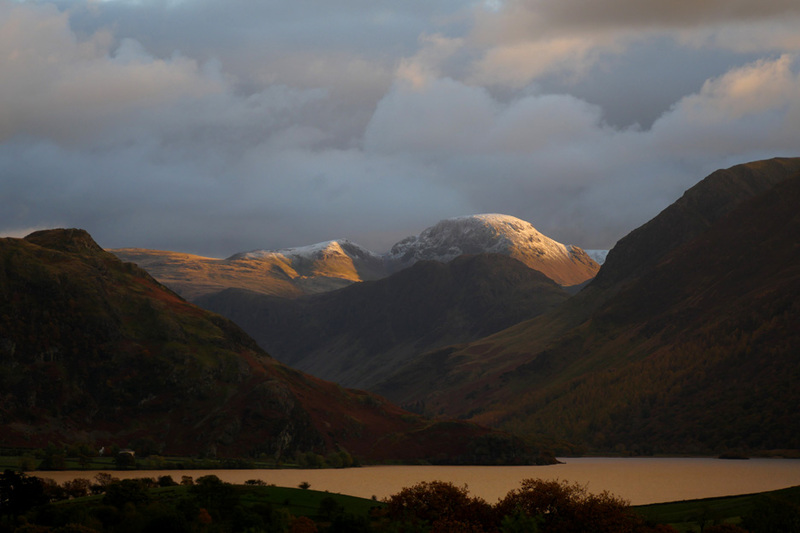 Haystacks is now clear as the cloud starts to lift. The wider view on life. 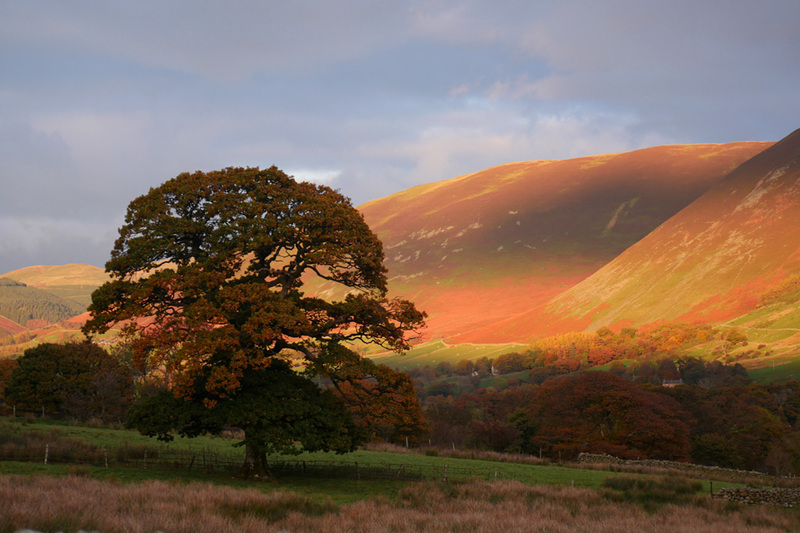 Lorton's Kirk Fell beyond the brown-leaved oak. 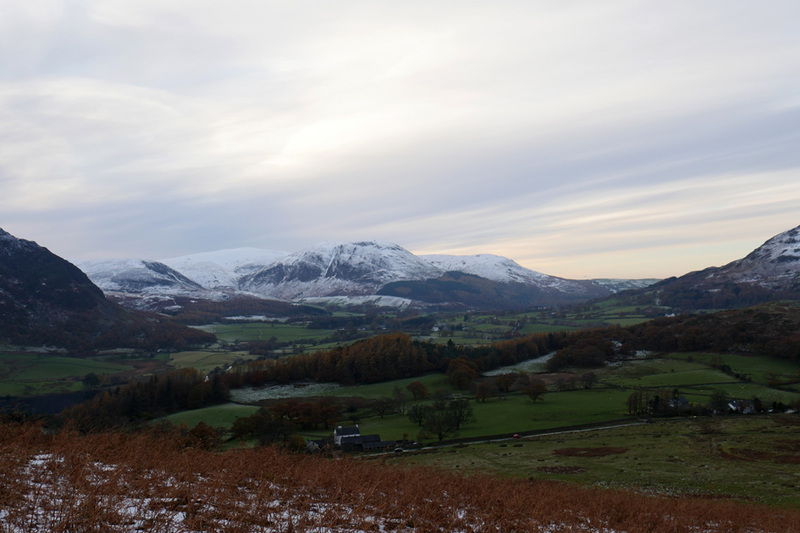 Across to Whinney Ridding Wood underneath Low Fell.
" 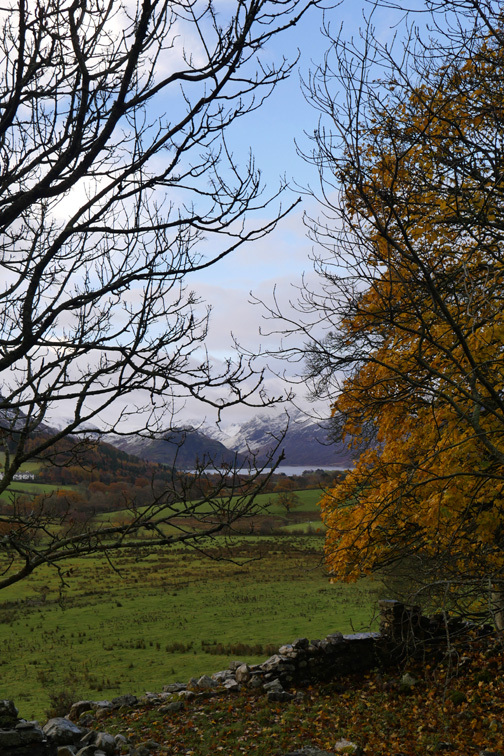 There be white bears in them there woods "
Crummock from the ruins of Pottergill Farm. 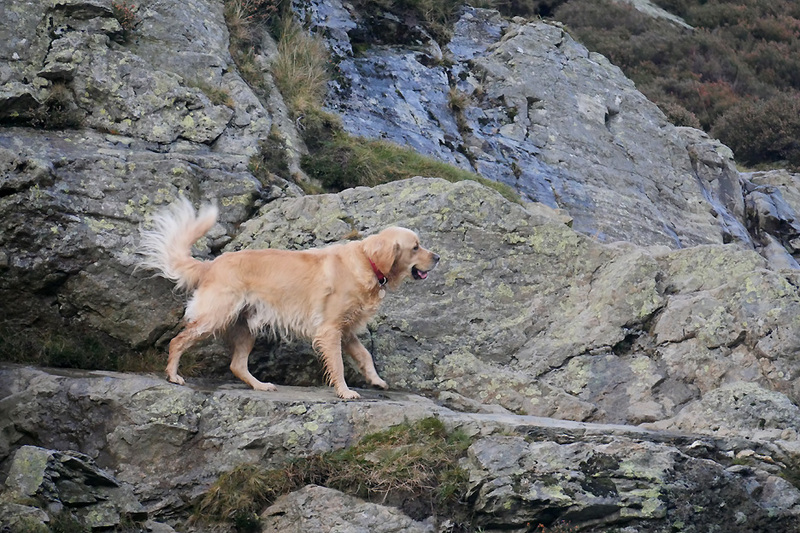 Watching Crag closer now with a foreground of bracken. 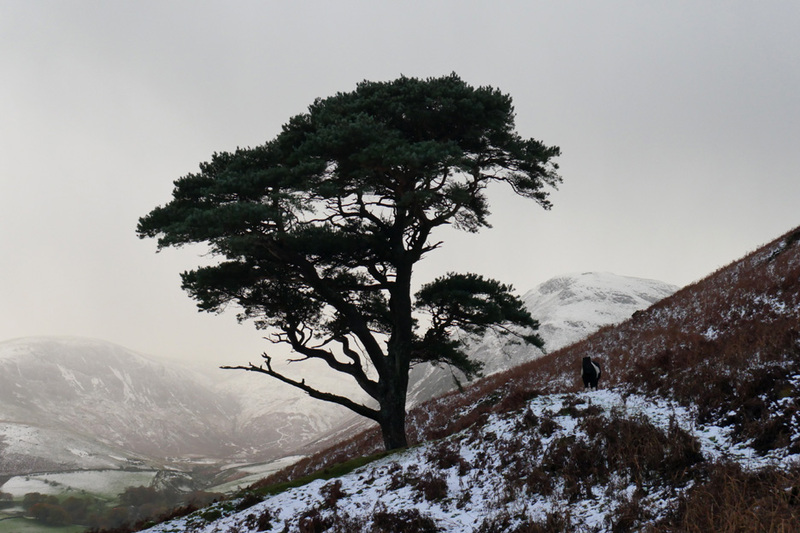 On slippery paths, heading back to the pine tree. Three types of animals have passed this way. 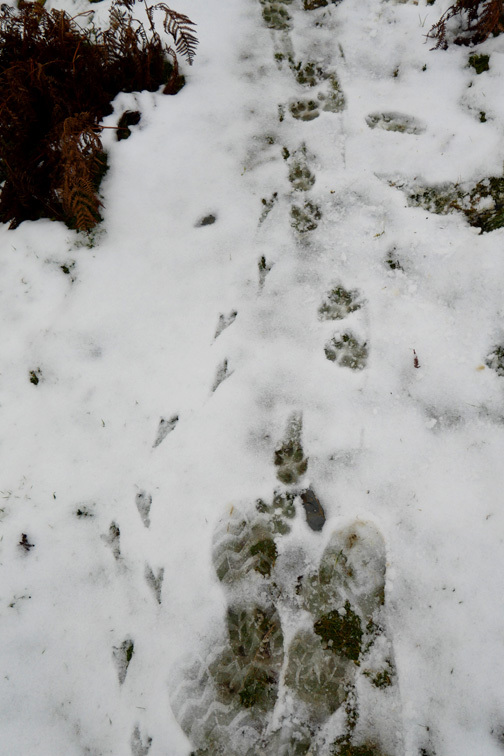 It has been a long while since I've photographed footprints in the snow. A fourth set of prints, hoof prints, were found over at the tree. 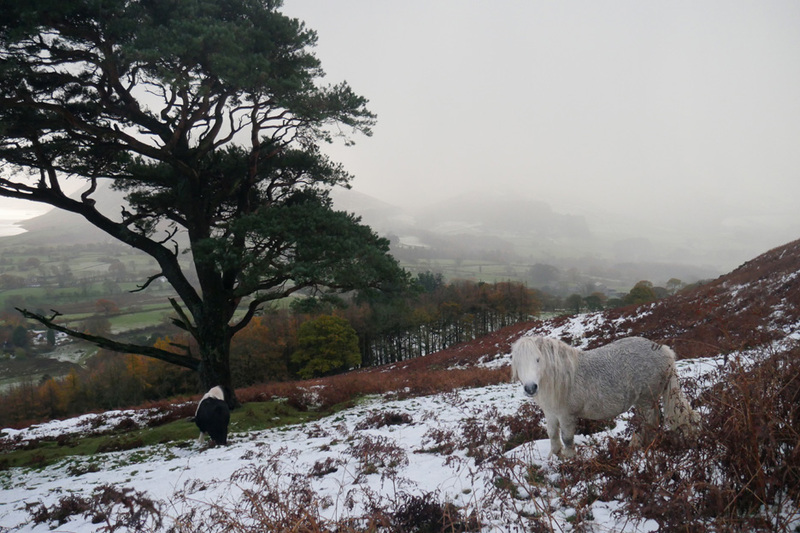 Two of the miniature ponies that spend their time on the slopes of Low Fell. Looks like the weather is turning in once more. 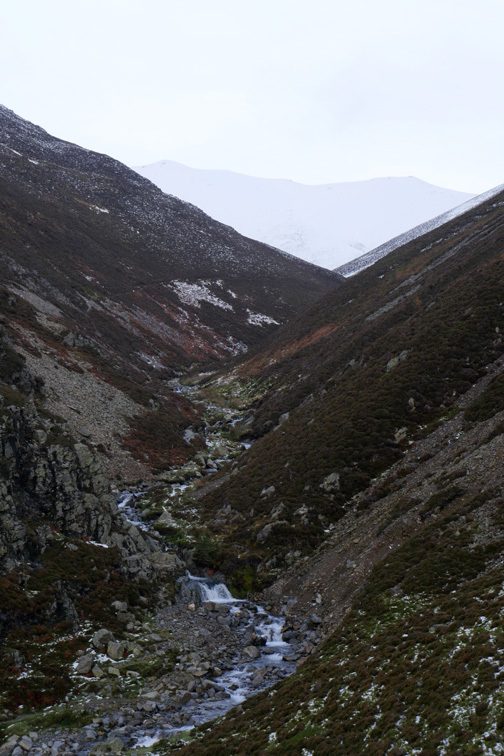 The classic view down the valley is fast disappearing. Back at the entrance gate of Wood End and the weather has changed once and is now changing back. 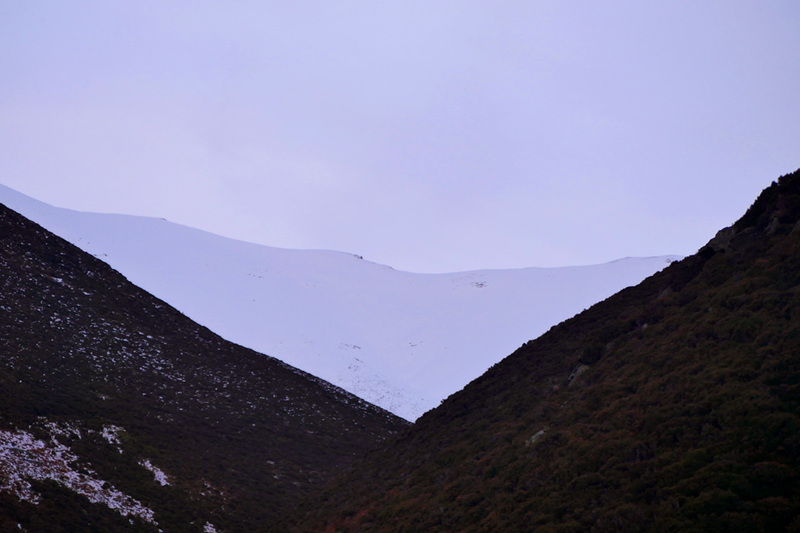 Hold your cursor over the picture to see the same place less than an hour ago. One final walk for this set . 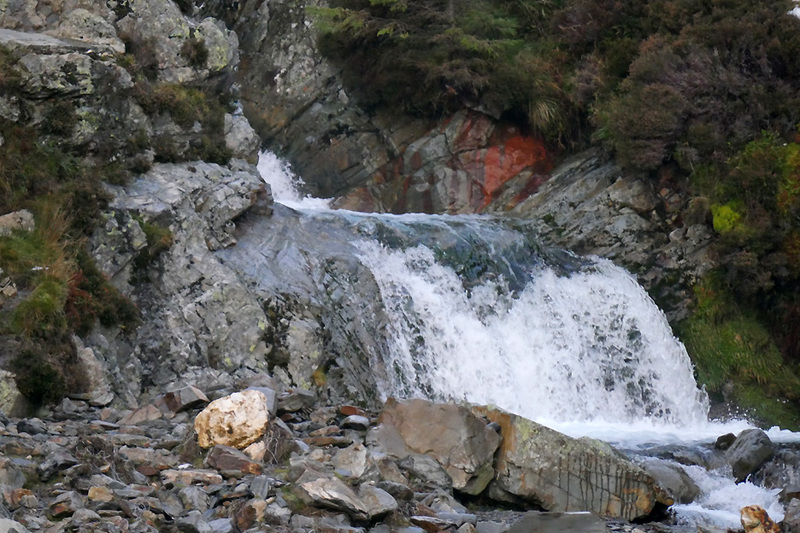 . . and it is a brief sojourn to the lower section of Gasgale Gill. The wide 2009 flood plain where the old gravel pit used to be. 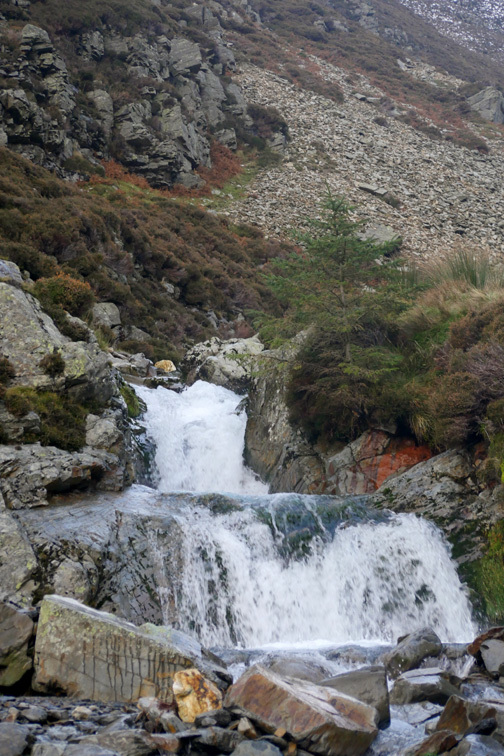 The waterfall in Gasgale Gill with Sand Hill behind.
" Snow on Sand "
" Dylan on rock "
Although it has been cold it has not been consistently cold enough for icicles yet . . . much to my photographic disappointment. 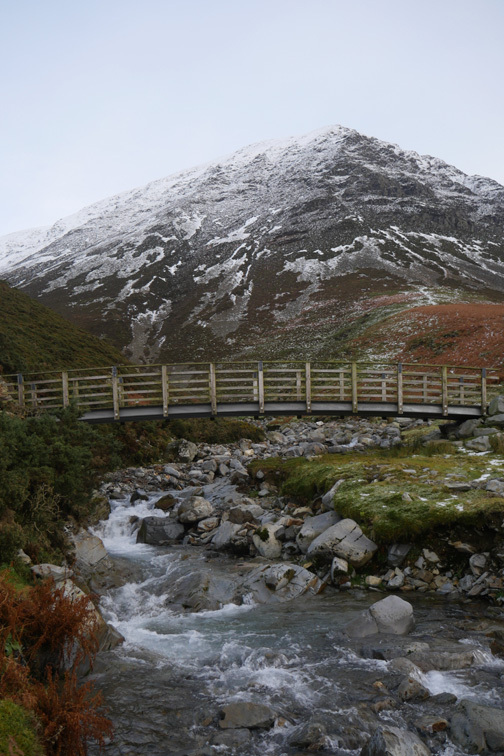 The double falls and the small Gasgale " bad step ". . .
. . . and the new bridge lower down below a cold looking Grasmoor. when I stopped the car and grabbed the camera . 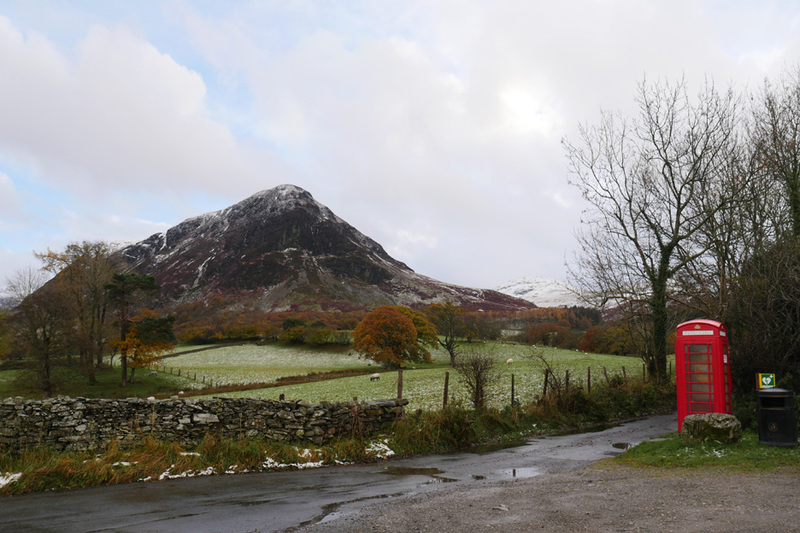 . .
" The Drovers Road - Loweswater "
The frost had gone from the big field this side of the church . 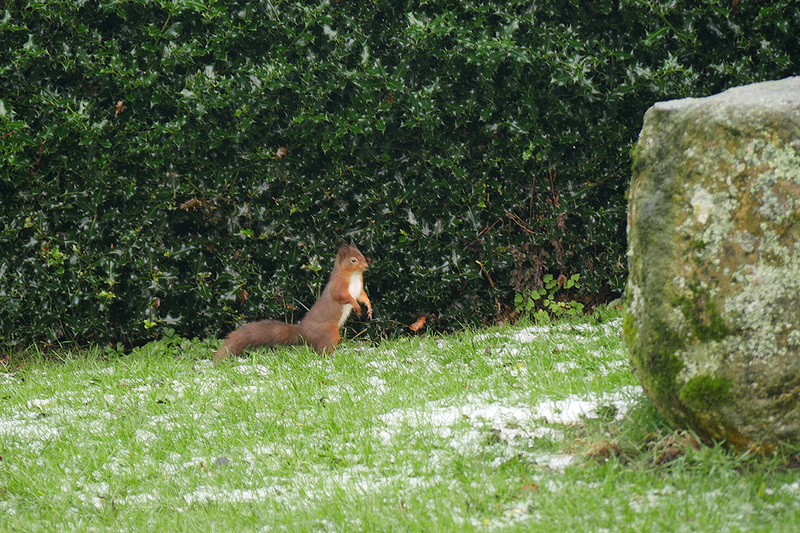 . . but had stayed all day on the north facing banks across the way. It's been a long day . 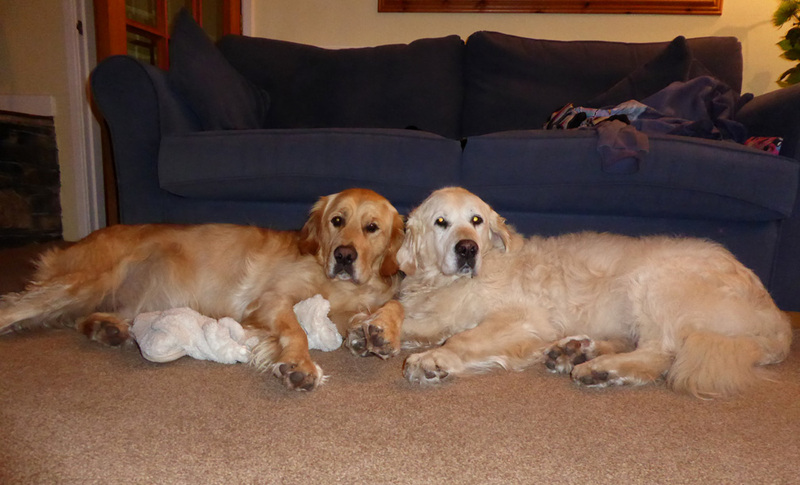 . . and we've had the family here over the weekend. Can we go to sleep now ? Technical note: Pictures taken with either Ann's new Panasonic Lumix TZ60, or my Lumix Gx8a Compact System Camera. This site best viewed with . . . a camera in hand when you need it.